b) large amounts of fresh dilution water. DVO IS CURRENTLY DIGESTING POULTRY WASTES, INCLUDING LITTER, FEATHERS, MORTALITIES, AND THE EGG WASH WATER, AT A 1.2 MILLION LAYER FAMILY FARM IN OHIO, USA. 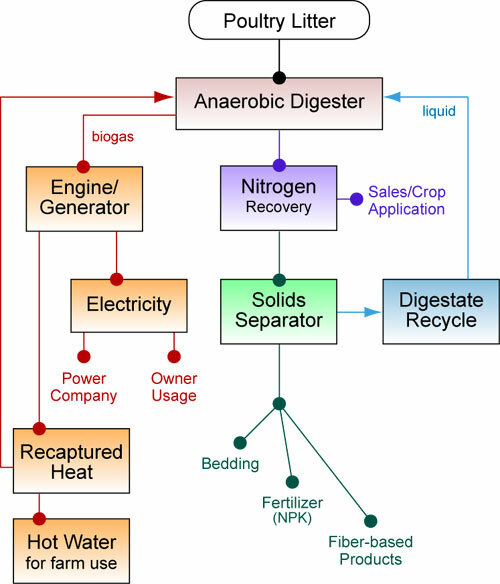 The anaerobic digestion of animal and organic wastes has long been known to reduce odors and to have the capability of CH4 production, with the subsequent conversion of the CH4 into electricity, bioCNG or heat. This has been accomplished on thousands of digesters utilizing cow, pig, and human wastes throughout the world. The primary reason that poultry manure has not been anaerobically digested at any commercial site is due to two main factors: First, poultry animals do not have an urinary tract and their waste is excreted at approximately 25% total solids. Add in feathers and the natural drying that occurs on the collection belts in the poultry houses, and we have a 40-60% total solids waste to digest. This total solids percentage is too high for a fluid-based digester system. One would have to dilute the waste with additional water to achieve a 7-10% total solids waste. However, this reduction in total solids percentage takes 5-8 times the volume of water, and therefore creates a subsequent water disposal problem after the digester. No one wishes to make waste from this much water and create a bigger disposal problem. DVO has developed a digester system that uses the processed waste (digestate) after the digester, and after this digestate has gone through a solids separation system. The solids separation system reduces the total solids content of the digestate so that this effluent water is suitable for dilution of the high solids content poultry manure. The practice of solids separation is well-proven on DVO digesters. However, the problem with the continuous recycling of digester effluent liquids from a poultry digester is the continuous accumulation of ammonium/ammonia in the liquid. Poultry waste is very high in protein compounds and these compounds biodegrade first into amino acids, and then from amino acids into ammonium. At a level of ammonium/ammonia above 3,500 ppm, ammonium/ammonia can become toxic to the methanogenic bacteria in the digester. Without a means to remove the ammonia, a digester will become acidic and eventually fail. DVO has patented a system where we further process the digester effluent to remove the ammonium/ammonia, using a natural, non-chemical method. DVO also captures this ammonia and places it in a stable and marketable form – creating another revenue source (or operating cost offset) for the digester. 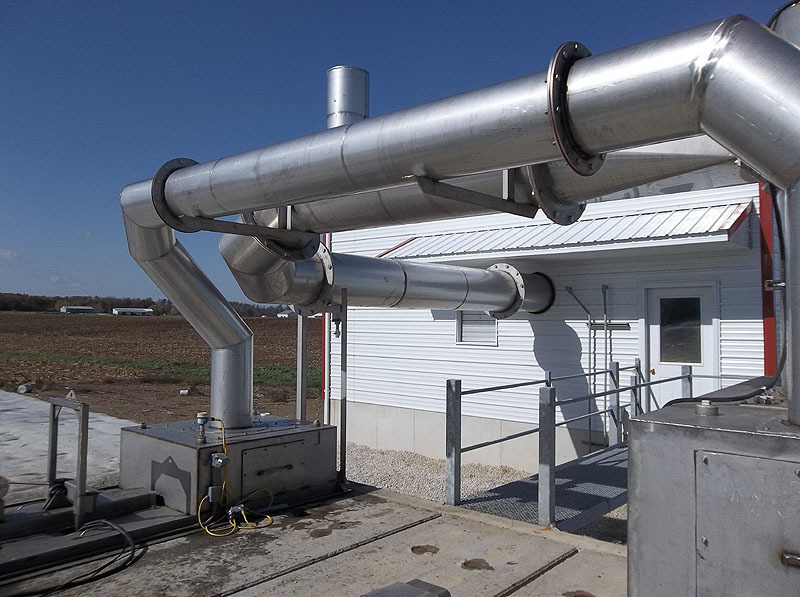 Significantly reduces the overall odor from the poultry facility and its waste. 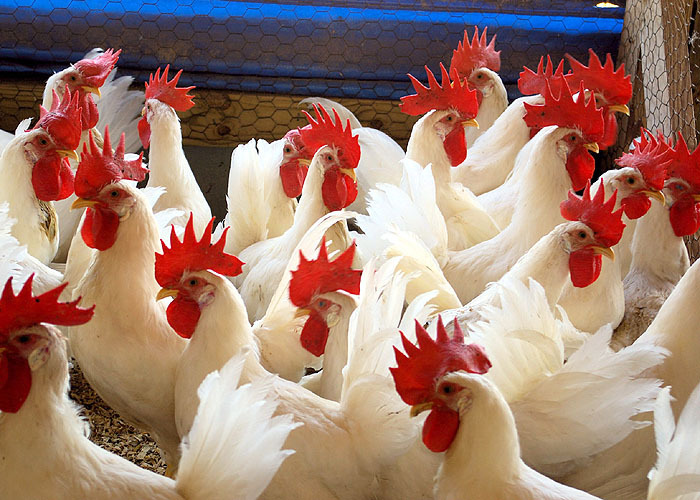 The DVO poultry system is an efficient, continuous, low maintenance system that requires minimal labor inputs. It truly has resolved the issues surrounding poultry digestion and is an asset to the waste management of poultry facilities. *NOTE: DVO may provide some, but not all, components depicted on this chart. Q: Can broiler litter also be digested? A: Yes. Barn top-scrape / cleanout intervals and bedding material selection can optimize digester performance.